"When I heard about the WASP program, I decided I wanted to learn to fly, which meant cashing in my bonds and taking leave from work." Margaret E. “Marge” Martin, long-time resident of Oak Harbor, passed away January 29, 2017. She was 95. Marge was born September 21, 1921, in Saratoga, WA. to George and Elva Neyman. She graduated from Sequim High School at age 16 in 1938. After graduating business college in Tacoma, Washington, she began working as a secretary for Standard Oil Company. Learning of the Women Airforce Service Pilots (WASP) training program, she earned her private pilot license in Spokane and applied to the program. After passing the required tests and personal interview, Marge was accepted as a member of class 44-7, paying her way to Avenger Field in Sweetwater, Texas. Of the 98 women who entered training with Marge, she was one of only 59 who graduated, September 8, 1944. 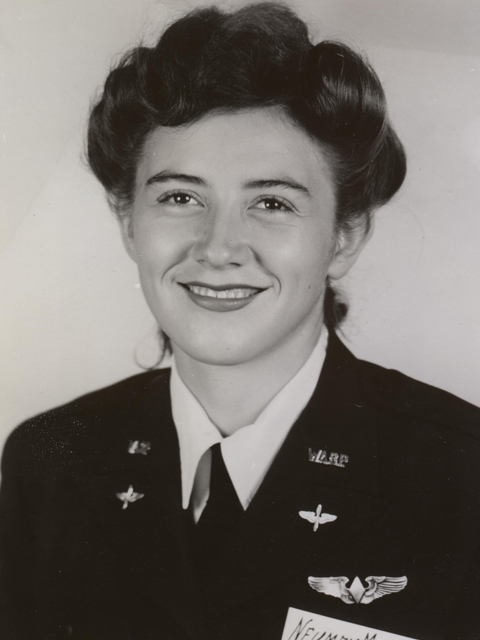 She earned her silver WASP wings and received her Army orders, sending her to Douglas Army Air Field, Douglas, Arizona. While at Douglas, WASP flew the BT-14, AT-8, UC-78, AT-9, AT-17 and B-25. Marge's flying assignments included administrative, engineering and utility flights. Following the deactivation of the WASP on December 20, 1944, Marge took a job in San Francisco where she met and married Paull Smyth. They moved to Whidbey Island in 1951 where she later began her career at Naval Air Station Whidbey Island. The young couple started a family, making their home in Oak Harbor and filling it with four children and beautiful memories. Marge later wrote: "Our home on the water has nine acres with geese, chickens, and peacocks. The Cascade Range fills our window with views of Mt. Rainier and Mt. Baker, which are pure white in winter." She worked at the Naval Air Station for 22 years, becoming secretary to the Commanding Officer before retiring. After Paull’s passing, Marge married C.J. “Tiny” Martin who predeceased her. She is survived by her four children, Fred (Anita) Smyth, Oak Harbor; Gretchen Smyth, Seattle; Mitsi Vondrachek, Newberg, OR; and Paula (Dave) Bondo, Mill Creek, WA; as well as four grandchildren and two great grandchildren. In lieu of flowers please consider a donation to the Nature Conservancy or the Sierra Club. Respectfully posted with permission from her family. Additional information included from Marge's entry p. 458, "Out of the Blue and Into History" by WASP Betty Turner.